A 127mm, F=1500mm Maksutov was mounted on an iOptron Cube Pro, AZ GOTO mount with extra counterweight. A DFK 21AU04.AS camera, fitted with a x2 Barlow was attached to the scope. A 1500 frame SER file was captured using AstroDMx Capture for Linux under Linux Mint. The SER file was stacked in Autostakkert! 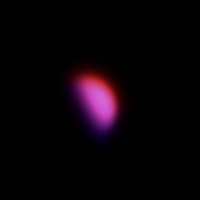 2, and the resulting image showed considerable atmospheric dispersion as Venus was so low in the sky. When white balance is implemented, better colour data will be obtained. SER player is able to perform a number of processes on all of the images in the SER file. One of these processes allows the manual alignment of the Red,Green and Blue colour channels. This was done. Then another feature of SER player was used, to create a monochrome SER file from the 3 colour channels. Thsi was done and the resulting mono SER file was registered and stacked in Registax 5.1 with slight wavelet processing. The resulting monochrome image was post-processed in the Gimp 2.9. The 0.59 phase of Venus is clearly visible, but no cloud features are evident.